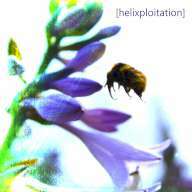 Is [helixploitation] by a bird? A plane? A bird AND a plane, in a type of chimera hybrid thing? A man in a red cape with superpowers? No, it’s a bird, a certain Static Noise Bird in fact. But the album art shows a bee. Yes, I can see how this could get confusing… my apartment complex has been infested lately with wood bees. I sort of wish they’d leave us alone and go find a pretty flower to hover around instead, maybe like the one on the cover of this album. … it all begins with ‘Sensual Abduction (Snoop Dogg Cover)’. Supra-sensual pads lift us into the clouds on the back of a bee, or a bird… really nice synth melodies float around, followed by a nice smooth electronic breakbeat rhythm. I love the space and majesty of this track! Little touches of crushed rock guitar and epic trance sequences give the track an energetic feel, the autotuned vocals make it feel very modern. It’s a very well produced dance track with lots of atmospheric feels. I’m like Gohan flying around on the nimbus with Snoop, drinking gin and juice in the hood, collecting dragon balls. Next track is ‘I Am The Mosaic’, which starts off with some very lush pads and a nice melodic/harmonic sequence. There’s a laserblast and some bass takes it up a notch. A drum n bass riddim approaches, gaining on us quick… I feel like I’m flying in lightspeed now, through canyons and clouds and waterfalls, all kinds of scenic stuff. The hyperbreaks get really intense and some lovely synth leads come in! I’m really enjoying myself on this track, it’s got such a great sound and is very professionally produced. Halfway through we’re dropped in a serene environment of pads and that lead, which I’ve been thinking this whole time sounded really familiar… my first thought was of maybe some old Ministry Of Sound single, and then I’m like, wait, is it Alice Deejay’s ‘Better Off Alone’ that I’m reminded of!? Hahaha, oh wow! I mean, I’ve had to go and listen just to be sure, and it’s not really the same lead, but it definitely registered as something familiar to me. Makes me laugh… I had somehow completely forgotten about that single, it’s been years since I last heard it. The drumbreak slowly grows again… these beats make you want to breakdance. ‘We Die In The Sunrays’ is a BMSR cover. Unexpectedly I hear acoustic guitar, and even more unexpectedly, I like it. Acoustic guitar is not my favourite instrument, though I find it tolerable in some few circumstances. It’s a nice melody, and then… *zoom-bah! * there’s a stylishly funky and technical rhythm that comes in with a lot of really awesome flourishes. I’m enjoying this track a lot right now, too. Then it’s ‘Traveller’s Breath’ coming in with a high-pitched and rapid breakbeat and an icy bit of ambiance. Chill, trancy, with very nice vibes, all driven by the drum n bass breaks and heavy synth sequences. Gets really intense, with what you could describe as industrial breaks added in for a moment. Wow!!! I love how it goes from intense and danceable to absolutely hypnotic without warning. ‘Heathers’ is the last track, reminding me that it’s been a few years since I last watched the movie Heathers, which is one of my favourite films… I have a lot of favourite films, though. Wynona Ryder was one of my also numerous boyhood crushes. Downtempo breaks with what sounds like a digital bass line. A breathy and wonderful synth chord sequence comes in, so nice sounding I quickly forget what I’m doing and sit here not even writing anything until it disappears. The breaks are alone again for now, along with some eclectic electronic rhythmic clips. Then some tribal grooves come out over the top, followed by a shuffling drum pattern, a crash, and the return of those sweet synths. This entry was posted in Uncategorized and tagged breaks, Drum n Bass, electronica, Progressive, Remixes. Bookmark the permalink.